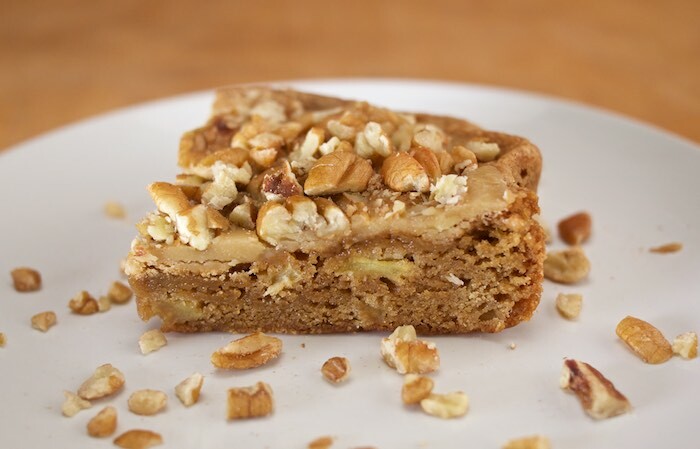 Apple Pecan Bars are easier to make than apple pie and equally as delicious. The combination of apples, pecans and cinnamon make them a perfect treat to be enjoyed anytime of day. The chewy texture of the apples will draw you in and the sweetness will keep you coming back for more. If you love apples this dessert is for you. Preheat oven to 350°F. Line an square pan with parchment paper and spray with cooking spray; set aside. In a small sauce pan, melt 1 tablespoon of butter with 2 tablespoons brown sugar and your cut apples. Stir to combine. Let simmer on low heat for about 5 minutes, until apples are slightly softened. Set aside to cool while you prepare the rest of the batter. Melt ½ cup butter in the microwave. Combine remaining brown sugar with melted butter in a large bowl and whisk to combine. Add the egg & vanilla, and whisk to combine. Add the flour, cinnamon & salt, and stir until just combined. Do not over-mix. Fold in the apples. Pour batter into prepared pan, smoothing it lightly with a spatula or offset knife. Sprinkle with chopped pecans. Bake for 30 to 40 minutes, or until the bars are set and a toothpick inserted into the center comes out clean. The edges will be slightly pulling away from sides of pan. Allow the bars to cool for at least 2 hours before slicing and serving.